Pâté is a mixture of cooked ground meat and fat minced into a spreadable paste. Common additions include vegetables, herbs, spices, and either wine or brandy. Pâté can be served either hot or cold, but it is considered to develop its fullest flavor after a few days of chilling. 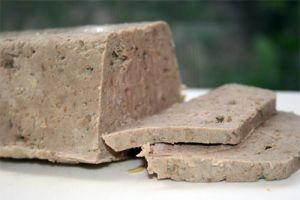 In French or Belgian cuisine, pâté may be baked in a crust as pie or loaf, in which case it is called pâté en croûte, or baked in a terrine (or other mold), in which case it is known as pâté en terrine. Traditionally, a forcemeat mixture cooked and served in a terrine is also called a terrine. The most famous pâté is probably pâté de foie gras, made from the livers of fattened geese. Foie gras entier is fattened goose liver cooked and sliced, not made into pâté. Pâté en croûte is baked with the insertion of "chimneys" on top: small tubes or funnels that allow steam to escape, thus keeping the pastry crust from turning damp or soggy. Baked pâté en croûte usually develops an air bubble under the crust top as the meat mixture shrinks during baking; this is traditionally dealt with by infusing semi-liquid aspic in the hollow space before chilling. In the Netherlands, Finland, Germany, Hungary, Sweden, Denmark and Austria, some liver pâtés are shaped as a soft, often spreadable sausage, called leverworst (Dutch), májpástétom/májkrém (Hungarian), or Leberwurst (German). In the United States these are sometimes called "liverwurst" (mixing English and German), or braunschweiger. Some liverwursts can be sliced. In the US, sliced liverwurst is used as a sandwich filler. Others are spreadable as most French or Belgian pâté; these types are more popular in the United Kingdom. In Poland, pasztet is made from poultry, fish, venison, ham, or pork with eggs, flour, bread crumbs, and a varied range of additions, such as pepper, tomato sauce, mushrooms, spices, vegetables, ginger, nutmeg, cheese, or sugar. In Scandinavia and the Netherlands, leverpostej is a popular baked pâté similar to the French pâté en terrine, usually made of lard and pork liver. In Russia and Ukraine, the dish is mostly prepared with beef, goose or chicken liver, however other meats also can be used. Unlike the Western European method the liver is first cooked (boiled or fried) and mixed with butter and/or fat and seasoning, such as fresh or fried onion, carrots, spices and herbs. It can be further cooked (usually baked), but most often is used without any other preparation. The pâté is served on bread, often with dill or other fresh herbs. In the former Yugoslavia, pašteta (a thinly pureed pâté) is a very popular bread spread usually made from chicken or less commonly tuna or salmon. In Vietnam, pâté (gan xay) is commonly used on bánh mì baguette type sandwiches. Pâté of this type is more commonly made from liver.